The UFR1001E system-disconnection relay monitors voltage and frequency in single or three-phase networks. It complies with the conditions and all the requirements of G59/3, G83/2 and the new G98 and G99 -protection, for feeding into the low voltage grid and for feeding into the medium voltage grid. When using with generators, the evaluation of feedback contacts for the period of a shut-down and during the synchronisation can be suppressed. The UFR1001E has two channels which makes it more fail-safe; input circuitry, evaluation and output relay are provided in duplicate. Two processors monitor each other mutually. 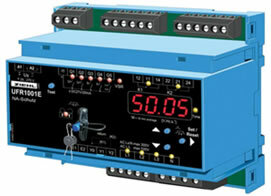 Feedback contacts are used to monitor the functioning of both output relays and the section switch. During an alarm both channels shut down, the cause is displayed, and it is reported through digital outputs, separate DC power supply required. 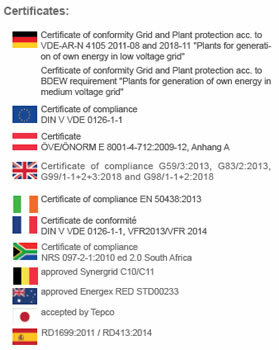 Applications include monitoring the network in generating plants, such as solar arrays, wind turbines, CHP Installations and diesel generator connected to the mains for Co-generation or peak lopping applications. Offering U/O Voltage and Frequency, as well as ROCOF the UFR1001E suits all installation types. The device complies with the requirements of the public utility power providers for conventional protection in low and medium voltage systems >30 kVA.